Chief Minister Virbhadra Singh today directed officials not to hold meetings with MLAs in state rest houses and said they were free to discuss issues in their offices. 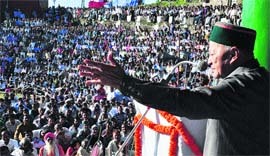 Chief Minister Virbhadra Singh addresses a public meeting at Sarahan on Tuesday. The state government may initiate punitive action against four of the 16 private universities that have been found guilty of violating the admission norms and not complying with the directions of the State Private Educational Institutions Regulatory Commission. Even as the Excise and Taxation Department has introduced the online declaration of goods to nab those who evade taxes, evasion of the value-added tax (VAT) continues unabated in the Baddi industrial area. To finalise the candidates for the next Lok Sabha elections to four seats of Himachal Pradesh, the All-India Congress Committee (AICC) has started the process for gathering feedback from the Congress leaders. Supporters of former Congress minister Rangila Ram Rao and Sarkaghat BJP legislator Col Inder Singh Thakur today turned the inauguration ceremony of a sports meet into a political battle at Senior Secondary School, Sarkaghat. Chief Minister Virbhadra Singh will launch the ambitious Rajiv Gandhi Ann Yojna under the Right to Food Act on September 20 from the Ridge Maidan here. Transport and Food and Civil Supplies Minister GS Bali has said the demand of private bus operators to hike fares, including minimum fares, will be considered sympathetically by the government. Transport, Food and Civil Supplies and Technical Education Minister GS Bali addresses private bus operators in Shimla on Tuesday. Taking a tough stance on the issue of causing environmental pollution in the Beas and its tributaries by hotels located in Kullu and Manali, the National Green Tribunal (NGT) has directed the Himachal Pradesh State Pollution Control Board (HPSPCB) to close down 34 hotels operating without obtaining the consent of the board. The Union Ministry of Civil Aviation has approved a proposal presented by the Indian Institute of Technology (IIT), Roorkee, to extend the runway at Kullu-Manali airport from the present 1,087 m to 1,500 m across the Beas here. A rescue team recovered the body of a youth, who was drowned in the Chamera reservoir on Sunday, from the dam waters near the Taleru water sports centre in Chamba district yesterday. With a view to restore the glory of the Khajjiar Lake in Chamba, the National Green Tribunal today directed the state authorities to not permit any commercial activity in and around and periphery of the lake at least up to 500 m from the waterline. Hamirpur MP and all-India president of the Bhartiya Janta Yuva Morcha (BJYM) Anurag Thakur launched a national-level signature campaign in favour of BJP’s Prime Ministerial candidate Narender Modi on his birthday here today. BJYM president Anurag Thakur launches a signature campaign at Hamirpur on Tuesday. Taking a note of excellent banking services provided by the Cooperative Bank, which is the one of the first banks in the state to switch over to core banking, the Himachal government has authorised it to undertake pension payments of its pensioners. About six cattle heads were washed away in a brook in the far-flung Guwari area in Tundah panchayat in Bharmour tribal sub-division of the district following widespread rain accompanied by a squall and thunderstorm on Sunday, according to a delayed report coming here today. A leopard attacked a male calf of a buffalo in a cowshed of Roop Lal at Nog village under Binolla gram panchayat, near here, last night. Following the government decision to lock the state office of the Himachal Pradesh Non-Gazetted Officers (NGO) Federation at the state secretariat building in Shimla, federation leaders owing allegiance to the Jogta faction have demanded the closure of NGO Bhawan in Hamirpur. Hindi has no competition with any other language and the need of the hour is to change the attitude and make the controversy of English versus Hindi a bygone issue. Hundreds of tractor-trailer owners from this part of Kangra district today called off their strike. Sundernagar MLA and Chief Parliamentary Secretary (CPS) Sohan Lal Thakur today inaugurated a four-day Youth Festival on the campus of Maharaja Laxaman Sen Memorial Degree College here. Hundreds of tractor operators drawn from various parts of Ghumarwin subdivision, including those from Ajmerpur, Dadhole, Sunhani, Barthin, Jhandutta, Talwada, Hatwaad, Barotta, Patta, Bhadrog, Glasasi, Bharadi, Bamm and Samoh village centres, converged at Ghumarwin, near here, yesterday in a peaceful rally. Students and staff of Government Polytechnic, Kangra, celebrated the 46th Engineer’s Day to pay tribute to Bharat Ratna Sir M Visveshvarya here yesterday. Slamming Himachal Pradesh for delaying the promotions of Scheduled Caste and Tribe employees on lame excuses, the Supreme Court has set a three-month deadline for the state to take a decision on the basis of 2009 or 2011 data. 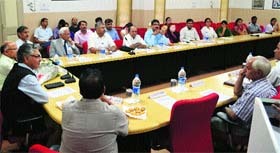 Taking strict note of complaints of officials meeting MLAs in rest houses in the district, the Chief Minister said he would take strict action against such officers who failed to abide by his directions. Addressing a public meeting here today during the first day of his two-day visit to the district, he announced to open a government college at Sarahan. He said the BJP government had de-notified the college due to political reasons even as he had announced its opening during his previous tenure. He also announced a grant of Rs 5 crore for constructing the college building. Earlier, the CM laid the foundation stone of Kwagdhar helipad to be constructed at a cost of Rs 10.30 lakh and a new building of the Civil Hospital, Sarahan, at a cost of Rs 6.29 crore in the Pachhad constituency. The Chief Minister presided over the closing ceremony of Bawan Dwadshi fair. He said the helipad facility at Kwagdhar would give a filip to tourism activities in the area, besides providing self-employment avenues to locals. The new hospital block in Sarahan would provide additional patient care facilities and people of Pachhad constituency would avail better health facilities. Virbhadra Singh said the petrol pump would again be made functional by HIMFED after holding an inquiry into complaints of mixing of water in fuel. He expressed concern over the poor quality of work on the Kumaharhatti-Nahan road. He said Rs 87.05 crore were approved by the World Bank for this road project. The CM addressed a public meeting in Nahan later in the evening. Speaking on the occasion, Health Minister Kaul Singh Thakur said strengthening health services, especially in the rural areas, was the top priority of the government. He said Rs 1,183 crore were being spent on strengthening health services in the state during the current financial ye6ar and 50 more ambulances had been added to the National Ambulance Services. He said the government was probing all benami transactions which had been executed in the state. Chief Parliamentary Secretary Vinay Kumar, Deputy Chairman, Planning Board, and former Minister GR Musafir also spoke on the occasion. Principal Secretary, Education, RD Dhiman said the government was serious about maintaining academic standards at all levels and violation of norms by private universities would not be allowed at any cost. If the universities failed to fall in line, the government would be forced to take initiate action under the relevant Sections of the State Private Universities (Establishment and Regulation) Act, which could even lead to “dissolution” of the erring institutions. Section 31 of the Act provides that admission in professional and technical courses shall be made only through entrance test, while Section 37 makes it mandatory for the private universities to comply with all the rules, regulations, and norms of the regulating bodies. In case of contravention of norms, Section 42 empowers the government to pass an order of “dissolution of the university” after serving a show-cause notice. The government, on the request of private universities, had relaxed the norms and allowed them to admit even those students who had not appeared in the joint engineering entrance (JEE) examination, subject to the conditions that they had secured minimum of 65 per cent marks in the qualifying examination. However, five of the 16 private universities did not comply with even the relaxed norms and admitted ineligible students. The commission had issued notices to these universities, but only Shoolini University complied with the directions and said admissions made in violation of norms would be cancelled. The commission had found that APG University had admitted 84 of the total 184 students enrolled for BTech in violation of norms, Manav Bharti University 30 out of 77 students, Baddi University of Emerging Science and Technologies 113 out of 485 students and Sri Sai University 70 out of 130 students. These universities did not file any compliance report to the commission. The ABVP has accused APG University of misleading the commission by granting admissions to ineligible candidates in the name of Pearson and MIT schemes, which was a farce enacted to provide admissions through the backdoor. ABVP leaders Ajai Thakur and Rahul Prasher have threatened to start a statewide agitation, if the commission failed to take action against the university. This is evident from the fact that almost 15 to 20 trucks carrying iron, steel, scrap etc, are found using escape routes to evade various inter-state barriers set up by the Excise and Taxation Department. The Haripur-Patta Mehlog-Baand route is one such route frequently used by the truckers carrying untaxed material manufactured in the Baddi-Barotiwala-Nalagarh industrial belt. Since the route leads to Kunihar, which further connects Ganhatti and Kingal, the manufacturers use this route to carry goods to Shimla and Kinnaur districts to evade taxes. The department charges VAT between 5 and 13.75 per cent for intra-state transportation. With no inter-state barrier on this route, loaded trucks carrying a variety of items, especially steel products, cross everyday evading VAT. The state government had amended the HP VAT Act, 2005, early this year, making the online declaration of goods compulsory to curb tax evasion. The state charges 5 per cent VAT on steel products and these heavy items primarily comprise goods transported through this route. Truckers plying on these routes are paid more and it is a lucrative business both for the manufacturer and the trucker. Since the route comprises two excise divisions in Solan and Baddi, there is an urgent need to coordinate and check tax evaders. Though the department has initiated a campaign to allow excise officials to detect tax evasion in areas outside their jurisdiction and several officials have nabbed evaders in Baddi, such routes have remained off the radar so far. In this connection, Vinod Chaturvedi, observer appointed by the AICC, recently toured party’s district headquarters in the four Parliamentary constituencies, except for tribal districts. After covering majority of district headquarters in Shimla, Mandi and Kangra districts, Chaturvedi today held interactions with party leaders at Hamirpur and concluded his tour at Una late in the evening. The observer also held meeting with Chief Minister Virbhadra Singh and Himachal Pradesh Congress Committee president Sukhvinder Singh Sukhu. The party leaders were also asked to put forth their choice of perspective candidates for the next Parliamentary elections from their respective constituency, keeping in view the winning chances of each candidate,” sources add. Congress leaders have also been asked to submit a detailed note as to why did the party performed well or bad in the last elections, giving their own observations. This exercise was is importance by the Congress leaders, since this feedback would be utilised by the AICC in zeroing in on the candidates for the Lok Sabha elections. Supporters of former Congress minister Rangila Ram Rao and Sarkaghat BJP legislator Col Inder Singh Thakur today turned the inauguration ceremony of a sports meet into a political battle at Senior Secondary School, Sarkaghat. They almost came to blows in front of a gathering of over 1,000 students. The police had to intervene to contain the situation from turning ugly. As soon as Rao, who was the official chief guest at the ceremony, inaugurated the under-19 schoolgirls’ district-level sports tournament, BJP MLA Inder Singh, who was not invited for the meet, along with his supporters, stormed his ways into the stadium and occupied the stage. Block Congress president Yog Raj Thakur during his address highlighted the achievements of the Congress government. But the BJP MLA, annoyed at being ignored at the meet, hit back at the Congress and accused it of ordering large-scale transfers. This irked Rao’s supporters who almost came to blows with the supporters of Singh. Policemen stepped in and escorted Singh and his supporters out. As commotion prevailed on the stage, both Rao and Singh remained mute spectators, said eyewitnesses. Singh’s supporters went about in the town raising anti-Rao and anti-Congress slogans. Both the rival groups lodged the FIRs at the Sarkaghat police station, accusing each other of starting the trouble on the stage. Congressmen charged Inder Singh with disrupting a function for which he was not invited, while BJP men alleged that Rao’s men tried to attack the BJP MLA on the stage. Stating this here today, Food and Civil Supplies, Transport and Technical Education Minister GS Bali said the scheme would benefit more than 32 lakh families of the state. “The beneficiaries, including the Below Poverty Line (BPL) people, Antodaya, single women, critically ill and social security pensioners, who are covered under the guidelines of this Act would get the benefit,” he said. Bali said all 16,99,225 ration-card holders of the state were already being provided three pulses, two kinds of edible oil and iodized salt under the subsidised ration scheme. He said the Right to Food Act would empower the beneficiaries to avail subsidised food items and enquire with the officers concerned about the delay in getting these items. He further said under the Act, each eligible person would get 5 kg of foodgrains per month. They would be provided 3 kg of rice at the rate of Rs 3 per kg and wheat at the rate of Rs 2 per kg. He said with the consistent efforts of the state government, the APL families would also get essential food commodities like before. The minister said the state would enhance its food storage capacity and strengthen the public distribution (PDS) system. He directed the officers to prepare a detailed weekly list of the foodgrains reaching at the wholesale depots and their further distribution to the retailers. He said complaints had been received that some private depot holders were not depositing the requisite amount in lieu of taking foodgrains which affected the consumers. He directed the officers to initiate disciplinary action after inquiry against the private depot holders who were knowingly delaying the payments. The government is in the process of appointing a consultant to help construct tunnels and aerial ropeways to reduce traffic congestion on the Cart Road, which is practically the lifeline of the state capital. Various agencies, including the Delhi Urban Mass Transit Authority (DUMTA), are also being consulted for the implementation of the CMP. With a huge amount of funds required for the project, the government is looking at multiple agencies like the World Bank, Asian Development Bank (ADB) and Union Surface Transport and Urban Development Ministries. The government is also hopeful of getting some funds from the 14th Finance Commission for the CMP. Even as big names like Hitachi have shown interest in setting up aerial ropeways to improve mobility in the town, the government is keen to appoint a consultant and then start taking up the CMP in a phased manner. A proposal had been submitted earlier by a British company to set up elevated rapid transport system, which will run on a spiral track at an elevated height. This system is already functioning at the Heathrow airport in London. As far as the cost aspect of the rapid transport system having pods is concerned, it is likely to work out far cheaper than having escalators or a circular rail line. The cost for one-km elevated spiral track would work out to be about Rs 45 crore, including the cost of the pods. The government is keen to cover the core area in the first phase, which will roughly work out to be about eight km. This includes the main area between Victory Tunnel, Bus Stand, Lift and Chotta Shimla, where there is an acute traffic problem. A Delhi-based company, which has submitted the proposal, is keen to set up and run the project on a build-operate-transfer (BOT) basis or as a public-private partnership (PPP) venture. To begin with, the government intends to take up the construction of only one tunnel, connecting the Lift near Metropole with Himfed petrol pump near Navbahar. Similarly, one main aerial ropeway connecting the inter-state bus terminus (ISBT) with the Lift will be executed first. Initially, one aerial ropeway and one tunnel will be made. Bali gave this assurance while addressing private bus operators from all over the state, who had assembled here to discuss their demands with him, here last evening. “Providing the best of the transport services to people of the state was the priority of the government and the private bus operators must not resort to strike as it causes inconvenience to the public,” he said. He added that the strike was no solution to their demands and all matters should be resolved through negotiations. “Electronic watches will be installed at all the bus stands so that buses ply on time,” he said. He said private bus operators would be allowed to showcase advertisements on their buses as this would help in generating additional income to them, which they would have to share with the Transport Department. He added that to provide more facilities to private bus operators, common facility rooms would be provided in every Regional Transport Office. He said passenger safety was of prime concern and 126 driving training schools were imparting driving skills to the unemployed educated youth of the state. He said private bus operators had been asked to ensure that bus drivers and conductors wore prescribed uniform and name plates, and passengers got proper tickets. The NGT, headed by Justice Swatantar Kumar, further directed the Member Secretary of Pollution Control Board to file a detailed affidavit before the tribunal as to where they (hotels) were disposing of sewage and waste and what treatment plants had been installed, if at all. The NGT passed this order when it was informed by the board that there were 129 hotels on the riverside in Kullu and Manali, and of them 34 had obtained their consent which was in force. Applications of 54 hotels are under consideration and 34 hotels are operating without obtaining the consent of the HPSPCB and have not even applied for one. Fifteen hotels have not applied for consent renewal while the application of one hotel has been rejected. The NGT further observed that “other major source of polluting the Beas and its tributaries causing environmental pollution is throwing of municipal solid waste and discarded vegetables directly into the river. The Marketing Committee, Bhuntar, is one of such parties responsible for throwing municipal /vegetable waste directly into the river, it said. The NGT issued bailable warrants against the secretary, Marketing Committee, Bhuntar and Prem Singh, the contractor. It further issued show-cause notice to them as to why they should not be directed to restore the environmental degradation caused by them in the Beas and why they should not be directed to pay a minimum of Rs 5 lakh each for causing environmental degradation. It further directed the government to divide the entire state into different clusters for the purpose of collection, handling and disposal of municipal solid waste. These clusters should be demarcated keeping in mind the economic conditions and capacity of the local government unit to construct municipal solid waste plant without delay. The state government has identified the land for the expansion of the airport. The Airport Authority of India (AAI) has decided to go ahead with the proposal after IIT, Roorkee, experts presented the feasibility proposal before central and state officials recently in New Delhi. 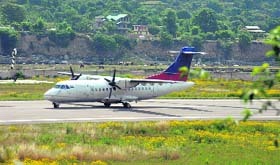 But the AAI had rejected the night landing at the airport, as the visibility was poor even during the daytime due to the foggy condition around Larji hill, said sources. The present runway had made landing and taking off of the bigger aircraft difficult. The pilots had to manoeuvre aircraft during landing and taking off, as it needed 1500-m runway to make the operation easy, said pilots. At present, the AAI is allowing the 40-seater aircraft to reach here from Delhi with full capacity, but return with 21 to 25 passengers as the runway is short and aircraft cannot take off with the maximum load. Earlier, a team from IIT, Roorkee, had inspected the runway site and recommended its expansion by another 400 m across the Beas that runs next to the airport. The AAI had doubts that the river might pose danger during floods. But the hydropower project had diverted the Parbati river, the major tributary of the Beas, from Pulga into Sainj river, bypassing the airport site, said AAI sources. “The proposal has been okayed by the Union Ministry of Civil Aviation as the IIT, Roorke, in its presentation found the expansion of the airport feasible”, said Subhashish Panda, Commissioner, Department of Tourism and Civil Aviation. The state will provide the land and the project will be funded by the AAI. “The work will start as soon as the IIT submits its complete report on the project, ” Panda added. Air India resumed its flight between Delhi and Kullu yesterday. The rescue operation was conducted under the supervision of officials of the Dalhousie administration. The deceased identified as Navjot, an MBA student, had come to Dalhousie for holidaying along with his parents. He wanted to go boating in the Chamera reservoir. Navjot had gone for urinating on the bank of a hillside where he lost control on himself and fell into the dam waters. On seeing this, village women cutting grass on a hillslope nearby shouted for help. Rajender Saini, father of Navjot, rushed there to save his son, but all in vain. After autopsy, the body was handed over to his parents who belonged to Hoshiarpur district. To ensure that no further damage is caused to the lake and the environment, it also constituted a six-member high-level committee comprising Chief Conservator of Forest AK Gulati, Superintending Engineer of the Irrigation Department (division concerned), Director of the Ministry of Environment and Forest, Secretary of the State Pollution Control Board, Director, Environment, and a representative to be nominated by Director, National Institute of Hydrology, Roorkee. The NGT headed by Justice Swatantar Kumar further directed the committee to submit a complete and comprehensive report to suggest the measures that should be taken by all authorities concerned to ensure restoration of the Khajjiar Lake and environment and ecology of the area. It further directed the authorities, including the Wildlife Officer and the police and the Forest Department of Chamba district to completely prohibit the entry of any animal in the glade area. It also told the authorities to ensure that there was no deforestation of the forest area and the catchment area of the water body. It also imposed a complete ban of use of plastic in any form in that area. The next hearing is on November 21. 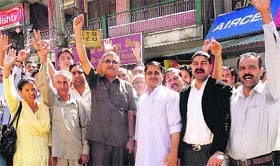 The MP, accompanied by BJYM activists, started the campaign from the Anu Chowk in the morning by signing on a banner. The activists also raised slogans in favour of Modi for more than an hour in which girls also participated. This drive would continue till September 20 after which these would be submitted at the Central office in New Delhi. The organisation has set a target of about a one crore signatures through this campaign. He has also appealed the youth to participate in the campaign and obtain maximum signatures in support of Modi. Bank Chairman Harsh Mahajan thanked the government and the Chief Minister for reposing confidence in the bank and said it would provide best possible services to pension holders. He said all its 203 branches and extension counters were online and part of the core banking network and it offered money transfer facility through RTGS, NEFT and ATM facility. The bank was in a position to extend prompt and uninterrupted services in far-flung areas where pensioners mostly resided after retirement. The bank had been providing the facility to salaried staff of the state and pensioners in Mandi district. Mahajan said the facility would help in widening the client base of the bank and also enable the beneficiaries in rural areas to receive pension and other such facilities at their doorsteps. Further, the bank would be able to contribute in the improvement of social and economic lives of citizens of the state, he added. The report said the fierce storm had pushed the cattle downhill into the brook. Rain water entered houses of the hamlet situated on a hillslope, but no loss of life and property had so far been received here. A tree had been uprooted along the road near Kanbla village and maize and paddy crops extensively destroyed in several areas of Bhattiyat sub-division. One woman was injured and admitted to the Government Civil Hospital at Samot in the area, the report said. Despite best efforts, officials of the area could not be contacted. Meanwhile, officials of the Himachal Pradesh State Electricity Board were on the job to restore power supply, official sources said. Reports said Roop Lal rushed to his cowshed when he heard some noise during the dead of the night and found a leopard killing his buffalo calf. Roop raised a noise which attracted neighbours to the spot and made the leopard run away from there. Village elders, led by panchayat vice-president Sanjiv Dogra, said a leopard had been found roaming in Nog, Kidhani and Pilani villages for sometime even during day time. This had made villagers panicky about the safety of their children and women. It had already killed some half a dozen cattle in the area during last one month. They urged the district administration and forest authorities to catch this carnivore and carry it away from their area. Following the government decision to lock the state office of the Himachal Pradesh Non-Gazetted Officers (NGO) Federation at the state secretariat building in Shimla, federation leaders owing allegiance to the Jogta faction have demanded the closure of NGO Bhawan in Hamirpur. The bhawan is under the control of the Mankotia group of the NGO Federation. Leaders of Jogta faction are demanding that the district administration should take control of NGO Bhawan till the issue is resolved. The Mankotia group is against it as the bhawan was constructed with the employees donations. Prof Furqan Qamar, Vice-Chancellor, Central University of Himachal Pradesh (CUHP), said this while addressing the inaugural function of Hindi Week and Hindi Day at Temporary Academic Block, Shahpur, today. He further said the knowledge of more and more languages showed the mental capability of an individual and that each one should have good knowledge of Hindi too. Prof Yoginder Verma, Pro Vice-Chancellor of the university, said the use of Hindi was increasing in every sphere of life. After the inauguration, a "kavya sangosthi" was held and invited poets Dr Om Avasthi, Pawanendra Pawan, Navneet Sharma, Dr Roshan Lal Sharma, Dr Sayema Bano and Chandrakant Singh recited Hindi poems, ghazals and songs. Dr Sanjeev Gupta, Dr Bhagwan Singh and students of the university also recited their poems. The tractor-trailer owners were on strike for the past nine days to protest against the challan issued by the authorities for mining sand and gravel from small and seasonal rivulets and khads in the area. The local Sub-Divisional Magistrate (SDM) apprised them of the ban imposed by the National Green Tribunal (NGT) on all mining activities in the country. Gulbant Singh, president, Tractor-Trailer Owners’ Union, said the strike had been called off following an assurance given by the Chief Minister and the Industry Minister in a meeting with the tractor owners in Shimla recently. He said the protesters, who had parked their tractor-trailers at various grounds in Nurpur, Shahpur, Gagal, Kotla, Jawali and Rehan, called off their strike today. The union president said the government had assured the strikers to formulate a separate mining policy for tractor-trailers after the final hearing of the National Green Tribunal on September 29 and short-term permits for lifting sand and gravel from khads would be issued to them through M-forms. He claimed that the Himachal government had constituted a three-member committee to explore the possibilities of separate mining policy for tractor-trailers in the state. Addressing the gathering, the MLA said the state government was spending 17 per cent of the total budget on education. He sanctioned Rs 1.50 lakh for the construction of a stage on the college premises and also gave Rs 5,000 to the participants. As many as 700 participants from 48 colleges of the state are taking part in the event. Earlier, college Principal Ashok Sharam, along with staff of the college, welcomed the chief guest and presented a memento to him. Hundreds of tractor operators drawn from various parts of Ghumarwin subdivision, including those from Ajmerpur, Dadhole, Sunhani, Barthin, Jhandutta, Talwada, Hatwaad, Barotta, Patta, Bhadrog, Glasasi, Bharadi, Bamm and Samoh village centres, converged at Ghumarwin, near here, yesterday in a peaceful rally. They were protesting against the ban on the extraction of construction materials like sand, gravel and stones etc from khads in the district and their being "hounded and harassed" by officials of six departments and being fined day in and day out. Led by their leaders Pramod Mahajan, Lakhvinder Rana, Dinesh Thakur, Nutan Chauhan, Kamal Nayan Singh Patial and Rajesh Kumar, they met SDM Pradeep Kumar and presented him a memorandum of demands for forwarding it to Chief Minister Virbhadra Singh and Industries Minister Mukesh Agnihotri detailing their difficulties and demanding the scrapping of this ban in the interest of their livelihood and self- employment and also to check smuggling of these materials and escalation of prices of these materials. They also met Chief Parliamentary Secretary (Forests and Fisheries) Rajesh Dharmani and presented him their demands charter. They urged him to take up their case with the Chief Minister to save their families from starvation due to this ban. Stress was laid on strengthening ethical values along with technical education. 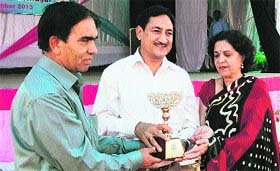 Suneel Verma, secretary, HP Technical Education Board, was the chief guest on the occasion. Vikas Sood, Executive Engineer, HPPWD Kangra, was the guest of honour who laid emphasis on the need of learning English, general knowledge and public relations techniques to attain success in the present day scenario. A declamation contest was organised on issue of national importance. Don’t keep giving lame excuses for delaying it... it is time to put an end to this charade -- this never-ending process of extensions and honour your commitment. A Bench comprising Justices SS Nijjar and PC Ghose lamented that the state had not implemented its promotion quota policy even after collecting the required data. “The state has totally failed to live up to the solemn statement made to this court. It has hedged and hemmed and prevaricated” ever since it took time from the court on April 26, 2010 for collecting more details on the representation of the SC/STs and passing necessary orders, the Bench observed. The apex court described as “the proverbial last straw on the camel’s back” the state’s latest excuse that it was awaiting the enactment of the 117th constitutional amendment by Parliament for ensuring impediment-free promotions to SC/ST employees across the country even in the absence of necessary data. “It is time to put an end to this charade -- this never-ending process of extensions” and direct the state to “honour” its commitments, the Bench said in its September 13 judgment made available today. Pointing out that the 117th amendment pending in Parliament “can be no impediment in the way of the state government”, the Bench asked the state to take a final decision within three months. Explaining the logic for finding fault with the state for its counsel’s April 26, 2010 excuse, the Bench said, “We are of the opinion that the statement was only to avoid a decision on the merits” of the appeal against the HP High Court’s September 18, 2009 judgment, quashing the instructions issued by the government on September 7, 2007. The appeal in the Supreme Court had been filed by the HP ST Employees Federation and the HP SC/ST Government Employees Welfare Association. On the basis of the state counsel’s April 26 statement, the SC had disposed of the appeal. “Thereafter, it was a series of false starts to avoid the implementation of their own decision and the directions issued by this court. In our opinion, this cat-and-mouse game has gone far enough,” the Bench held. The apex court’s latest verdict has come on an interlocutory application filed by the two SC/ST organisations seeking a directive to the state government for implementing the quota policy and a contempt petition by them against the state for ignoring the apex court orders.